Fast and convenient operation for authorised vehicles. Versatile for use in a wide range of locations and applications. Structurally strong to physically prevent unauthorised vehicle access. Safe to operate and maintain. Reliable ensuring low maintenance requirements. Affordable when compared to all other automatic gate systems. The Company's Patent application (PCT Patent Application No. 64532/99) covering the unique features of Cable Gate is proceeding through the Examinaton Phase worldwide. Cable Gate has been designed to provide a physical barrier against unauthorised vehicle access to and from secured premises. Two steel posts are secured to concrete footings located on either side of an opening and an 8mm stainless steel cable is securely locked between the posts. Cable Gate can be installed in a wide range of locations as it does not require any opening space above, below or alongside the Gate. Cable Gate can be solar powered allowing it to be installed in locations where access to mains power is not available. Photoelectric Beam: A reflective Photoelectric Beam passes between the Master and Passive Posts. This beam prevents the Gate from closing while the opening is obstructed. Closing Overload Sensor: If an excessive load is applied on the Cable while the Gate is closing, the Gate Controller will detect the load and cause the Gate to re-open immediately. Opening Overload Sensor: If an excessive load is applied on the Cable while the Gate is locked (eg a person sitting on the cable), the Gate Controller will detect the load and the Gate will not open until the load has been removed. Entry Mouth Safety Latch: The Entry Mouth on the Master Post is fitted with a Safety Latch to prevent objects or fingers being caught or jammed while the Gate is closing. If the Safety Latch is triggered while the Gate is closing, the Gate will re-open immediately. Use of Battery Power: Two 12v 7ah Rechargeable Batteries power the Gate. In the event of a mains power failure, the Batteries will enable the Gate to continue to operate, thereby providing continued access for vehicles. Low Voltage Power Supply: Power is supplied to the Batteries via a 24v 1amp Plug Pack connected to a mains power outlet. This avoids the hazards of 240-volt power supply up to and on the Gate. Where access to mains power is restricted, power may be supplied to the Batteries from a Solar Panel kit. Gate Controller shut down - Clear Faults Switch: The Gate Controller will attempt to open or close the Gate a programmed number of times (generally five times). If the Gate is not open or closed after the five attempts due to an obstruction or a fault, the Controller will shut down and the Gate will remain closed or open. To operate the Gate again, the Gate Controller must be reset through the use of the "Clear Faults" button located on the Gate Controller, or the optional "Office Box", once the obstruction or fault has been removed/corrected. Reflective Striping and Signage: Highly reflective striping and signage are installed on the Master and Passive Posts to ensure that the Cable Gate is visible to approaching vehicles and pedestrians during both day and night. Sheathing on main cable: A bright orange reinforced rubber sheath is fitted to the main cable to enhance the visibility of the Gate. "Cats-eyes" and reflective road striping can also be installed with the Cable Gate to further enhance the visibility. To enhance the visibility of the Gate to vehicles and pedestrians at night-time, we recommend customers install adequate lighting around the Gate location. In order to control the speed at which vehicles approach the Cable Gate, we recommend customers install devises such as speed humps, or other traffic calming/speed control devices to alert drivers to slow down and proceed cautiously. The durability and reliability of Cable Gate has been established through extensive workshop testing and in-field operation. The modular design of Cable Gate provides for easy and efficient repair and replacement of parts. 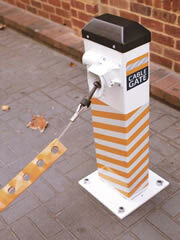 Cable Gate is supplied with a Manufacturer's 12 month Parts and Labour Warranty. In addition to all of the above features, Cable Gate is very affordable to purchase, operate and maintain when compared to other automatic gate systems. Upon receiving an "open" command, the Locking Latch inside the Master Post is instantly pulled down allowing the Main Cable to fall to the ground under the action of gravity. The Counterweight Bar on the outside of the Passive Post helps to pull the Main Cable out of the Master Post, and lay the cable flat on the ground so that authorised vehicles may enter through the Gate. When the Gate is open the Main Cable remains connected to the Master Post by the thinner Pull-in Cable. The Cable remains securely attached to the Passive Post at all times. The Gate will remain open for 25 seconds (or any other period that has been programmed, up to a maximum of 65 seconds). If a vehicle has not passed through within this time the Gate will automatically close to resecure the entry. To reopen the Gate, a new "open" command will be required by the Gate Controller. When a vehicle passes through the Gate, the Photoelectric Beam is broken. While the Photoelectric beam is broken the Gate is held open. Once the vehicle has cleared the Gate and the Photoelectric Beam is re-established, the Gate will close automatically. To close the Gate, the Motor drives a Winch Drum inside the Master Post that winds in the Pull-in Cable. The Pull-in Cable draws the Main Cable in through the Entry Mouth and locks it securely over the Latch inside the Master Post. If the Gate receives another "open" command, prior to closing after the passage of the first vehicle, the Gate will remain open to allow the second vehicle to enter before closing automatically. One 20mm x 300mm square Bolt Cage Assembly (280mm centres) with nuts and washers per Post. The Cable Gate can span a distance of up to 8.0m. The minimum span is approximately 4.0m. How durable is the cable and the sheathing on the cable? Both the cable and the sheathing are designed to withstand heavy traffic loads. The cable is made of 8mm diameter stainless steel cable wire. The sheathing is made from rubber with an embedded nylon webbing for additional strength. The wear on the sheathing will depend on the coarseness of the surface it is dropping onto. It is designed to be a low cost, easily replaceable item.